With the silly season in full swing sometimes we all need a little pick-me-up. 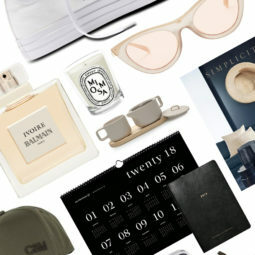 In a moment of indulgence—because let’s face it, it’s pretty hard to resist when you’re already feeling spend-y—our FQ editors compiled the top treats they want to buy for themselves this Christmas. From designer shoes to beautiful books and luxe beauty routines, be inspired by our ultimate wishlist. Saint Laurent Edie metallic pumps, $1,212 AUD ($1,343 NZD), from Net-a-porter. These Saint Laurent heels would have me feeling festive in a flash. Aesop Hwyl Eau de Parfum, $160 NZD. This fragrance was worn by a friend recently and now I’m hooked. It’s probably poor form stealing your pal’s signature scent but if I claim Santa gave it to me then it’s okay, right? Zoe & Morgan Rising Sun Earring, $575 NZD. I’ve had my eye on these beauties for a while now and after a huge year, this feels like the perfect present to self to celebrate. Santa, I have been very good or at the very least, intend to be. Fenty Beauty Stunna lip paint, $41 NZD, from Sephora NZ. I’m forever a MAC Retro Matte Liquid Lipstick girl, but Badgalriri’s brand new offering is going to test my loyalty loyalty loyalty. Aquazzura Dylan mules, $790 NZD, from Matches Fashion. These emerald alligator-effect beauties are the only crocs you’ll ever see on my feet. F + H Jewellery The freedom cross bracelet, $179 NZD, from Superette. Always a sucker for a (sac)religious accessory, I know where I’ll be getting my crucifix fix this year. Realisation Par The Violette, $225 USD ($328 NZD). Summer dressing sometimes has me stumped, but this Realisation Par dress will have me breezing from the office to outdoors with ease. The Beauty Chef Holiday glow pack, $99 NZD, from Superette. I’ve had luck with The Beauty Chef products in the past and they’ve starting popping up everywhere again – so I think it’s about time I re-stock. Meadowlark Captial letter signet, $229 NZD. I’m a self-confessed romantic and have been eyeing up this Meadowlark signet ring in the first letter of my boyfriend’s name. Beau Coops Alice ankle boot, $499 AUD ($553 NZD). I can never have enough black boots! Apres Surf rashguard, $156 NZD. I’m obsessive about protecting my skin from the sun, so I’d love this chic rashie for beach days. Hourglass Confession lip archive collection, $1,038 NZD, from Mecca. This collection is the ultimate lipstick wardrobe with two chic gold holders that you can swap out with each and every colour. Mansur Gavriel mini circle bag, $981 USD ($1,429 NZD), from Farfetch. I’m obsessed with Mansur Gaviel but have yet to actually splash out on a bag so I’m hoping that Santa will do so for me. Southside Royale by The Cocktail Collective, $115 NZD. I’m always looking for a new summer drink to try. These cocktail boxes look amazing and I’m really excited to splash out and get one. Gidon Bing for Kowtow Flask Vase Rose, $155 NZD. You can never have too many vases especially for when those secret admirers send flowers. Le Specs Nero rose gold, $129 NZD. I’ve had my eye on these cat-eyed sunnies for a while now and they’re high on my wish list for summer. Diptyque Baies candle, $122 NZD, from Mecca. I am a massive candle fiend and love nothing more than filling my home with a delicious scent. The rose and blackcurrant notes of Diptyque’s Baies will always be my favourite. Caravan: Dining All Day, $60 NZD, from Whitcoulls. One of my most-loved brunch and dinner spots in London, Caravan’s Kiwi founders have now produced a recipe book which I’m hoping will make my own cooking just as revered! Isabel Marant glittered leather and suede sandals, $809 USD ($1,176 NZD), from Net-a-porter. I would love nothing more than to take these glitter Isabel Marant numbers for a spin on the dance floor this party season. African Botanics Pure marula oil, $158 NZD, from Mecca. Nothing beats waking up to a beautiful complexion, and this little potent elixir is pinned to be the next big thing in skincare so naturally I’m eager to join its cult following. Ovna Ovich Shelk dress, $320 NZD. This is a self-indulgent item on my lust list. I’ve always been a fan of Ovna Ovich’s philosophy and design approach, and there’s something about this matcha green that keeps me coming back. Trouble is, I want to wear it on Christmas Day, so it might be an early treat. Balenciaga Goldette earrings, $529 NZD, from Love and Object. These vintage earrings would be the cherry on top. Definitely not a necessity but I would adore them for decades to come. I should probably put in an order for a ear filler or an ear lift while I’m at it. Miu Miu Point-toe patent-leather flats, $705 NZD, from Matches Fashion. Nothing says I’m ready for anything like these cute little Miu Miu flats and I can easily see myself making the transition from day to night – no shoe change required. Paris George Basics Emma slip, $320 AUD ($354 NZD), from the UNDONE. I’m naturally drawn to all things the shade of olive and so I’ve easily fallen in love with this classic slip dress. Momo Tokyo, $40 USD ($58 NZD), from Ransom Ltd.
Momo Tokyo is the photographic journey of one artist’s trip around Tokyo with a single pink backdrop. Beautiful, charming and eye catching, I’m already picturing it on my coffee table. Vintage Fendi oval sunglasses, $189 NZD, from Girls Money Club. Nothing says ultra chic quite like this pair of vintage Fendi’s and they’d be the perfect eyewear update for my wardrobe.